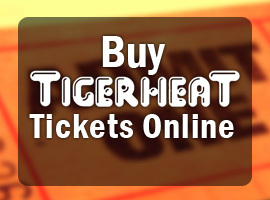 TigerHeat features hot go-go dancers. 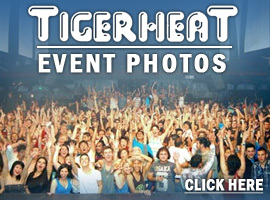 See them perform live at TigerHeat Thursdays. Personal Goals: I want to be a professional dancer, choreographer, and show director. Personal Quote: Ask Kathy Griffin lol "FISH"
Favorite Song to Dance to: I learn to like all of them. Personal Quote: "Leave a legacy worth sharing"
Most Embarrassing Moment: Fell off the bar! Favorite Song to Dance to: Changes all the time! Most Embarrassing Moment: Surprise kissed this dude thinking he's my date. He was definitely not him. Favorite Song to Dance to: Partition/Yoncé by Beyoncé, Buttons by The Pussycat Dolls, I'm a Slave 4 U by Britney Spears, etc. Most Embarrassing Moment: I slipped on juice. Personal Quote: "Where a smile, one size fits all." Favorite Song to Dance to: "Big Booty" by Jennifer Lopez or "2 on" by Tinashe. Hobbies/Interest: Dancing, hiking, going out, going to the beach, watching movies, and video games. Most Embarrassing Moment: No comment. Personal Goals: Dancing on stage and teaching. Personal Quote: "Never give up on someone that you can't go a day without thinking about." Favorite Song to Dance to: "Problem" by Ariana Grande. Favorite Song to Dance to: I'm a Slave 4 U by Britney Spears. Hobbies/Interest: I love the outdoors! Hiking is one of my favorites. I love running and dancing/music/partying. Personal Quote: "If you want a thing done well, do it yourself." Favorite Song to Dance to: "You Make Me Feel" by Cobra Starship feat. Sabi, but my favorite song right now is "Glad You Came" by The Wanted.